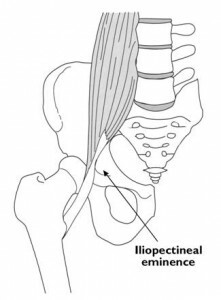 In a snapping hip, a tight iliopsoas tendon “pops” over top of the femoral head, the iliopectineal eminence and labrum. The “popping” may produce a loud sound, and may cause a sensation that the hip is popping out of its socket or dislocating. In many cases, flexing and extending the hip can reproduce the snapping. When a snapping hip is painful and does not improve with stretching and physical therapy, the tight iliopsoas can be released arthroscopically to alleviate the snapping. There have been documented cases of developing snapping hip after a total hip replacement. Below is an article discussing a specific case and the arthroscopic treatment.